Every night of ISDC is no longer available at the Union Station (Wednesday is sold out). The Pear Tree Hotel is currently available for all nights. The Pear Tree is conveniently located across the street from the Union Station. Please click here for more information. 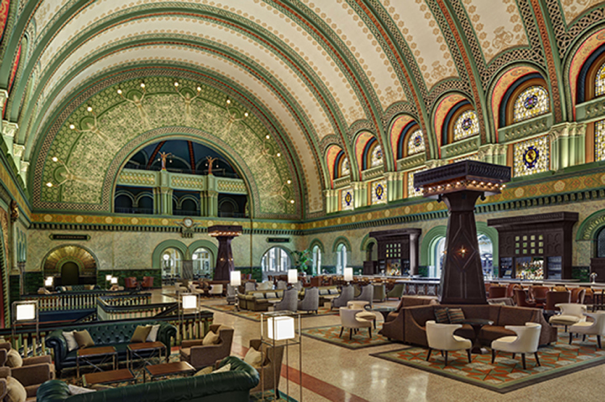 NSS negotiated a special room rate at the conference site hotel, St. Louis Union Station Hotel, for the dates including May 21 through June 1, 2017. The rate per night is $135.00 USD per room, plus applicable taxes. Subject to availability. ISDC® 2017 will be held at the historic St. Louis Union Station Hotel. 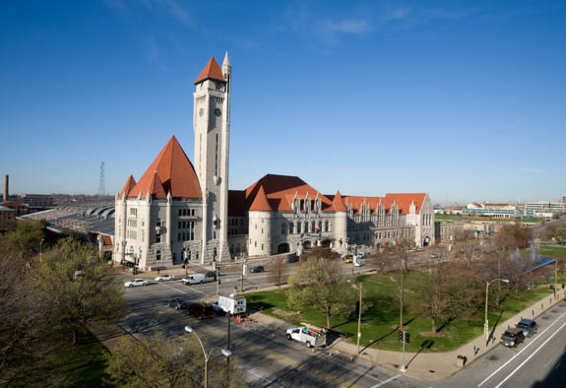 Once the largest and busiest passenger rail terminal in the world, St. Louis Union Station now serves as one of America’s great historic tourism destinations and event spaces! Union Station first opened in 1894, but ceased operation as an active train terminal in 1978. Union Station reopened in August of 1985 as the largest adaptive re-use project in the United States geared toward St. Louis tourism, commerce, and events. The elegant 120-year-old National Historic Landmark includes the Grand Hall, the jewel of St. Louis Union Station, which now features an innovative high-definition projection mapping dazzlingly projected on the Grand Hall’s 65-foot tall ceilings and across the space. The Midway which shepherded 100,000 travelers a day will be the Exhibit Hall. 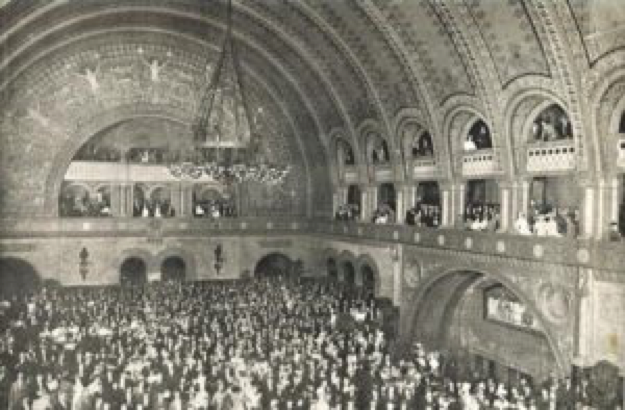 On September 1, 1894 St. Louis Union Station opened as the largest, most beautiful terminal in the United States. In its prime in the mid 1940′s, more than 100,000 passengers a day passed through Union Station. After World War II, however, the general public began choosing other forms of transportation. Finally, on October 31, 1978, the last train pulled out of St. Louis Union Station. In 1976, this magnificent station was designated a National Historic Landmark. In March 1979, Oppenheimer Properties purchased the Station for $5.5 million. 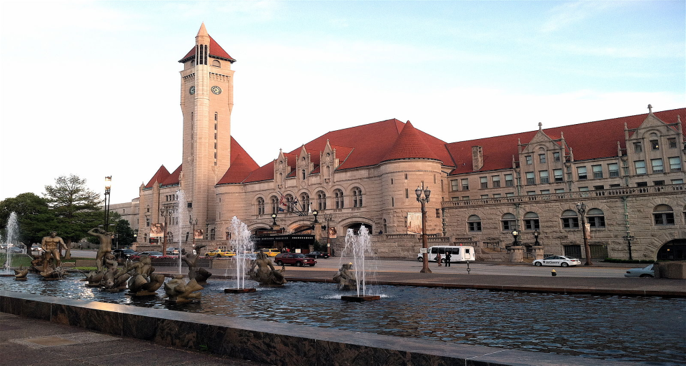 In August of 1985, St. Louis Union Station reopened after $150 million restoration, making it the largest adaptive re-use project in the United States. Union Station dedication on Sept. 1, 1895. Visit The Grand Hall website at www.grandhall-stl.com. The Grand Hall, with its sweeping archways, fresco and gold leaf detailing, mosaics and art glass windows, is the crown jewel of Union Station. Renovated and restored in 2014, the Grand Hall now features an award-winning, first of its kind high-definition projection mapping experience in the United States. Projected on the Grand Hall’s 65-foot tall ceilings and across the entire space. Created by Technomedia, an award-winning collaborator with entertainment companies like Cirque du Soleil, NBC Studios, JRA and many others. This incredible 3D mapping immersive experience is the first of its kind in the US. Hotel guests of all ages will enjoy the 10+ stories being told though sound, music and cutting edge 3D animation. Behind these Walls, Under the Sea, Trains and Dimensional Hall are some of the shows currently playing. Revisit Union Station’s past in a video narrated by actor John Goodman that features photos of the landmark train station and its passengers. The vignettes also feature narration by actor Jon Hamm and sportscasters Bob Costas, Dan Dierdorf, and Joe Buck. If you want to experience this building coming to life, literally… don’t miss the Grand Hall Experience at Union Station.